Greta was our first big major label release. 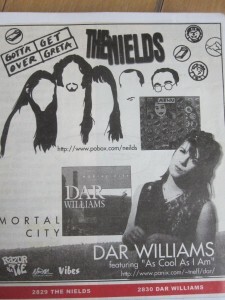 This is taken from the songbook we published in 1997. 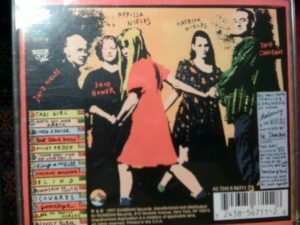 Greta began in the fall of 1994 when Dave Hower called me up a few minutes after I’d called him to tell him we had twelve gigs in October for which we’d be needing his services. He said, “I’d better join the band for good.” I ran, shrieking, to the building next door [the NEO theatre at Loomis Chaffee School] where David Nields and Dave Chalfant were working on some music for Peer Gynt. I told them the great news. 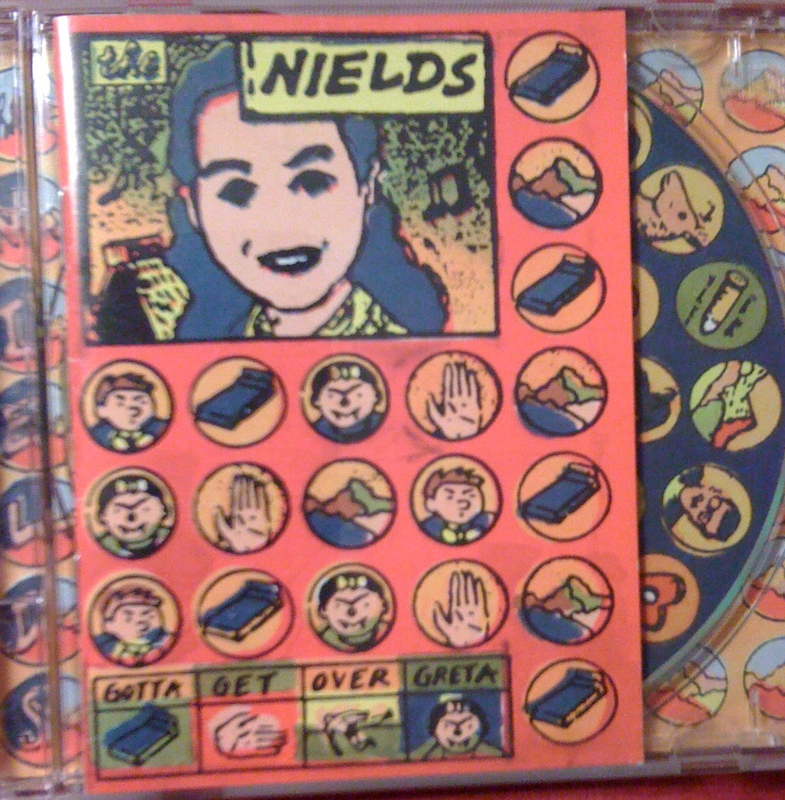 At that point, after many years and three previous recordings, The Nields, the five of us, was complete. So we began preparing for that eventuality by seeking out different producers. A trip to Memphis was in order to do some work with John Hampton at Ardent Studio (he produced the Gin Blossoms there). Out of those sessions we kept takes of “Cowards” and “Alfred Hitchcock” for our EP Abigail. We also recorded “Fountain of Youth,” which later made it onto “Greta.” We had a great time with Hampton and ate a lot of peanuts and played with the velcro cats who prowled around the studio and would stay suspended on the carpet-covered walls just like those birthday party balloons do when you rub them just so. In the fall of ’95 we relocated to Long View Farm Studio in North Brookfield MA to record with Kevin Moloney, a lovely, delightful Irishman fond of Guinness and the Beatles. We were psyched to work with him because we greatly admired his production of Sinead O’Connor’s first record The Lion and the Cobra. He slept in Keith Richard’s windowless room and ate a strict vegetarian diet, except for the last night when he had lamb with mint sauce. 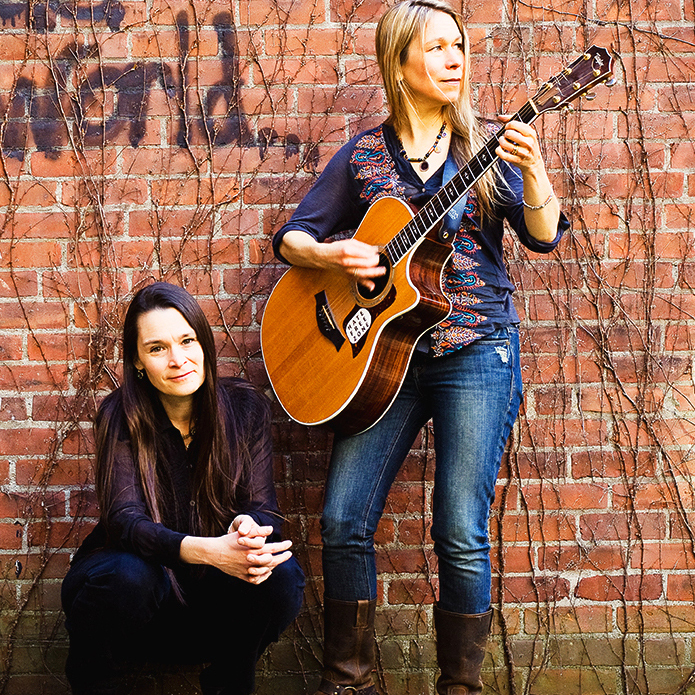 We breathed in the good New England autumn air, patted the horses and made our record, track by track. [designed by Stefan Sagmeister, who went on to become a Grammy award winning artist, designing covers for Lou Reed, the Rolling Stones, Talking Heads] she attracted a lot of attention from the press and we found ourselves driving like crazy from radio station to radio station to tell our story and sing some songs from the CD. 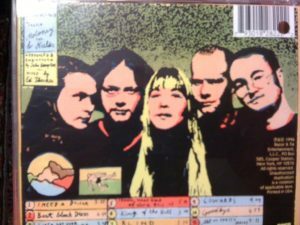 Within two months, a major label [Mercury Records’s president Dan Goldberg] called Cliff and Craig (presidents of Razor & Tie) and negotiations began to buy out our contract and re-release Greta. By September, a second label got into the bidding, and on October 3 we signed with Guardian, a division of EMI. Just a few days earlier, we’d reconvened at Long View to reocrd a brand new song called “Einstein’s Daughter.” We also called up Dar and she popped in to sing her part on “Lovely Rita.” In January, 1997 the label flew us out to sunny Hollywood where we stayed at the swanky and slightly seedy but very historic Hotel Roosevelt and record the last track for Re-Greta with the man Victoria Williams calls “that nice Paul Fox.” Paul did an amazing job on “Taxi Girl,” and our record now starts with the song about our long lost friend. I hope someday she hears it. 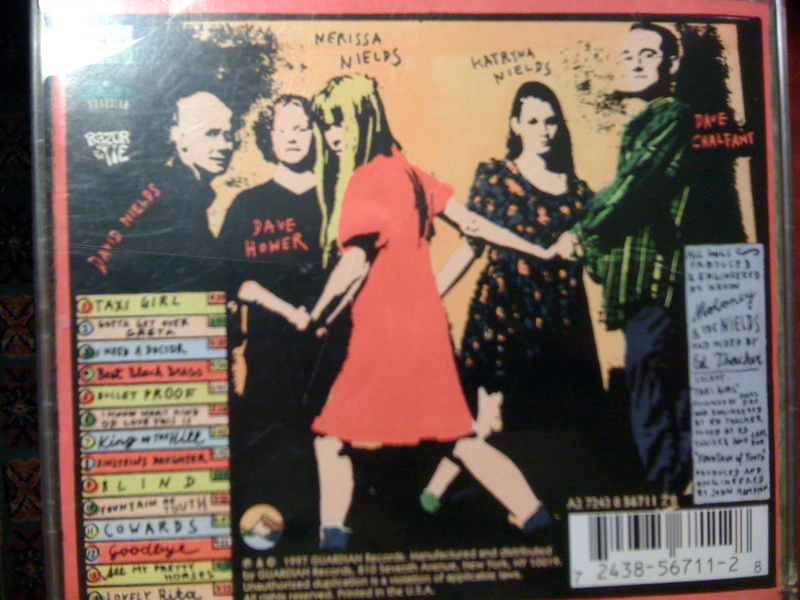 ON May 6 1997, Guardian released Gotta Get Over Greta with a new blue cover and and a red CD peeking through. 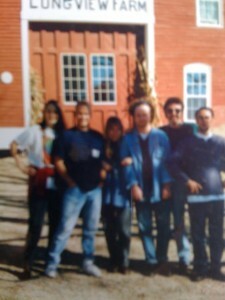 Since that autumn day when Dave Hower made that fateful decision to be our drummer, we’ve driven our trusty white Dodge Ram Van named Moby around the country (two and a half times), sold 15,000 copies of Red and Blue Greta, made countless batches of Greta cookies and tee shirts, lobbied Ben and Jerry to name a flavor “Strawberry Nields Forever” and made thousands of new friends all over the country. It’s always been our goal to have our songs made famous over the airwaves of this country’s campfires and school buses. This book is a step in that direction. 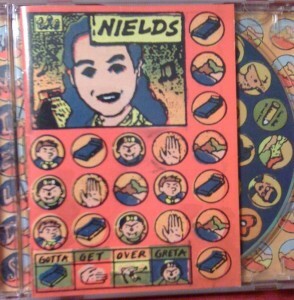 Silly question: If you chart the Nields story along the Beatles trajectory, which album is this? 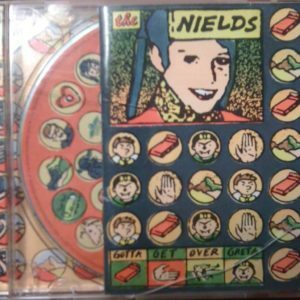 The Nields’s Revolver? Not a silly question, and you are uncannily accurate. I do think this is our Revolver, at least in sound quality. But from a timeline aspect, it might be more Rubber Soul. Also as a departure from the previous.